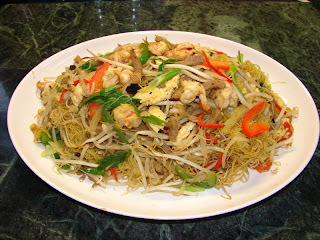 Singapore fried rice vermicelli or (xing zhou chow mai) is available in nearly all Chinese restaurants and takeaways all over the world. The funny thing is this dish is not traditional Singaporean. It was a creation by some Hong Kong chef. Thin rice vermicelli is normally the noodles used as the name ‘mai’ means rice Vermicelli, but I have seen so many variations including wheat noodles and flat rice noodles. Other common ingredients include some curry powder, char siu and some small prawns. This is my version closest to what I can remember from a restaurant. In a frying pan or wok, put in about 1 tsp of oil and fry the egg into omelette, cut into small pieces. Put aside. Add a bit more oil in the pan/wok, put in the half the onion and garlic, stir fry till lightly brown add in the prawns (if raw stir till change to pink/ white), char siu and pepper slices. Remove from pan and leave aside. Add about 1 ½ tbsp of oil in the pan/wok (best use a clean wok if the wok is not 100% non stick, if not noodles may stick to wok) add in the rest of the onion, garlic and chilli, stir then add the curry powder, stir again till fragrant then add noodles, keep stirring and tossing (best tossing with a pair of chopsticks), at the same time sprinkle on enough soy and oyster sauce to taste. If the noodles look very dry sprinkle on some water. Stir fry till fragrant, add the meat and vegetable mixture, egg and bean sprouts and spring onion, stir till hot and ready to eat. **If you like a vegetarian version, leave out the meat, prawn, oyster sauce or egg. Use puffy tofu, firm marinated tofu or fried fresh tofu or fried seitan or fried tempeh. Add more vegetables if you like like carrot or mangetouts. Try adding a tsp of curry paste will give a more flavour than just curry powder. Maybe use a little veggie stock powder.